Yes, it's obvious that I have a fixation on certain types of food. I can't resist most meatballs, or get enough chickpea patties. The last one was not so long ago, and it was rather simple, but delicious. 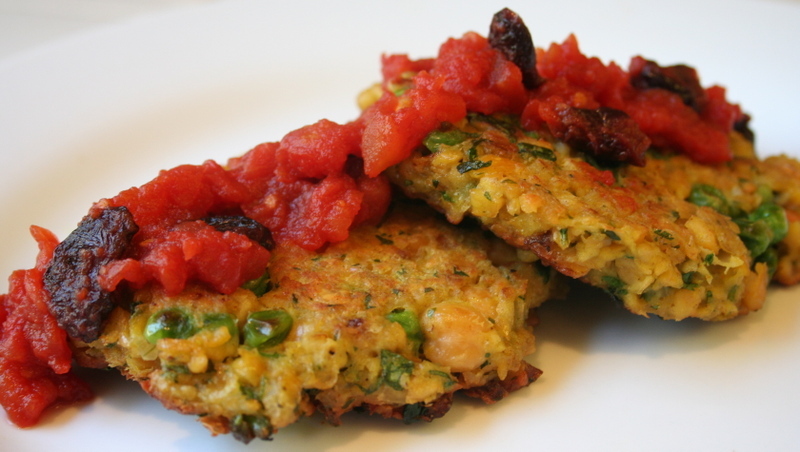 The chickpeas were ground fine, and combined with tomato sauce and a little cream, to make a patty crisp on the outside, but creamy on the inside. This time, I wanted to make them more rustic, rough textured and filled with vegetables. And I would season them with the dynamic duo--cilantro and cumin. 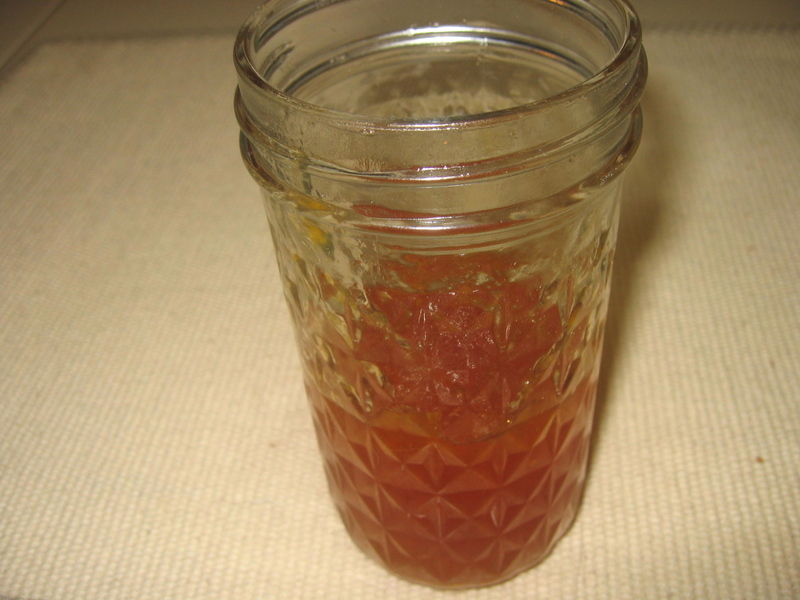 I also made a "jam" made of chopped tomatoes, lemon juice, dried cherries, and honey. It turned out just the way I wanted, delicious and filling. 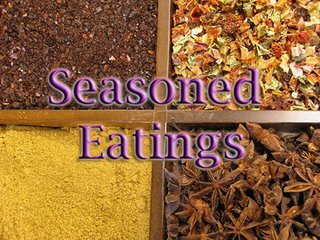 Seasoned Eating: My Package came! Country Girl City Living and Thyme For Cooking are hosting Seasoned Eating, a sort of Secret Santa global sharing of local flavors. I already received the name of my recipient, and mailed off a gift of spices and local food to said person (it's a secret at this point). Then I waited to receive a gift from my Secret Santa. Imagine my delight when I finally received a package from Lydia of The Perfect Pantry. I love reading her blog, and always think of her whenever I look at my chaotic pantry. I'm sure hers is organized and filled with wonderful items. 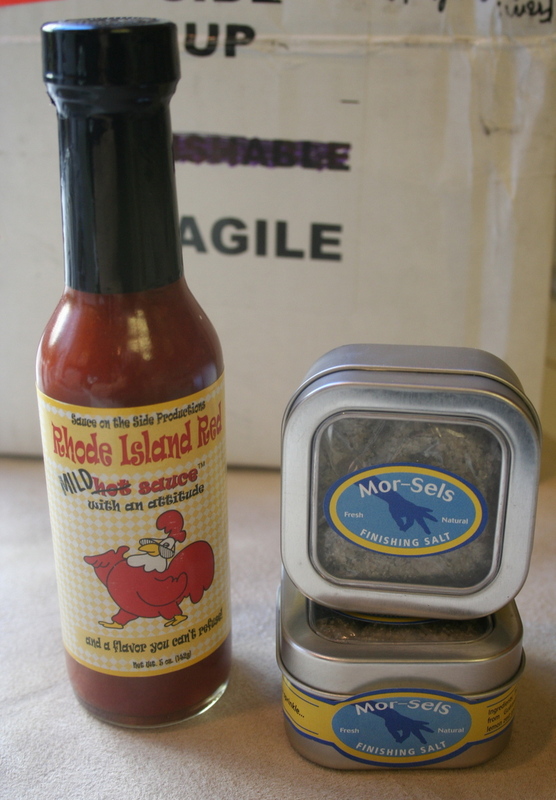 And now, thanks to her, I have Mor-Sels Finishing Salt and Rhode Island Red Sauce to add to my pantry. Such was my excitement when I opened the package, the bottle of sauce fell out onto my tile floor. I watched in horror as it bounced twice when it landed, but amazingly, didn't break. Those glass bottles from Rhode Island are certainly tough little guys. I always clean out my freezer when family and friends are expected for Thanksgiving dinner. For some reason, I'm afraid that one of them will inexplicably decide to inspect said freezer, and scream in horror upon seeing my chaotic system of storage. So, just in case there's a surprise inspection next Thursday, I cleaned and organized it today. There were some interesting finds in there. Hidden back in one corner, under a bag of frozen pesto cubes, I found two unlabeled containers of some sort of frozen liquid, possibly corn and mushroom stock. And there were several bags of cranberries that I bought to make jam, but never did. I found lots of nuts, pastry scraps and small bags of eggs whites. But, best of all, I found a small package of chicken-apple cocktail franks and half of a whole wheat baguette. I don't know how long the little franks have been hidden in there, but I decided to use them for my lunch. 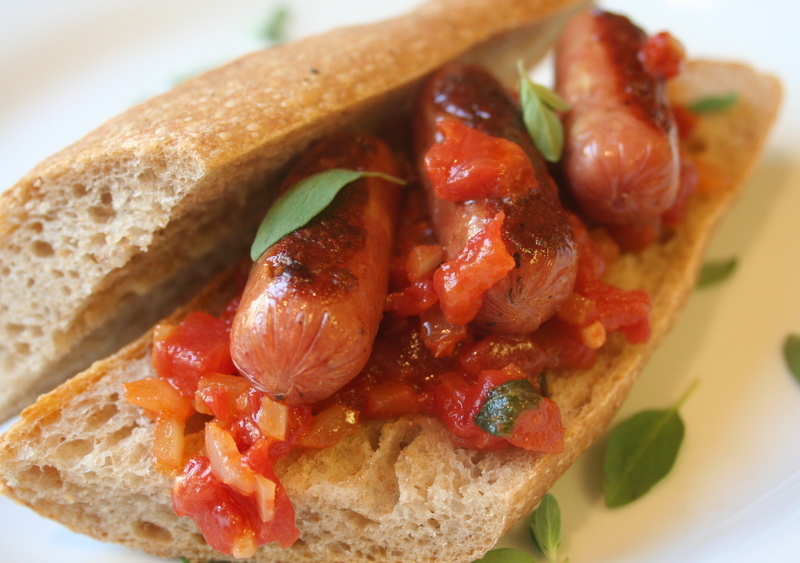 I cooked them briefly in a skillet (they were pre-cooked) and slapped them onto the baguette with some tomato relish. Suddenly, cleaning the freezer was a good thing. Last Friday was Bob's birthday and I made his favorite dessert, bread pudding. But, I forgot to include the milk in the custard and the result was very bad indeed. So, feeling that that I owed him a proper dessert, I made another version this Wednesday. This time I remembered to add all the ingredients, which improved matters enormously. The last bread pudding was a coffee and expresso flavored concoction, but I decided to make an entirely different recipe, based on Nigella Lawson's Ginger Jam Bread Pudding. I knew Bob wouldn't enjoy the ginger marmalade she favors, so I used some of my own homemade pear jam and some store bought blackberry jam. This bread pudding is a little different from other versions I've eaten. 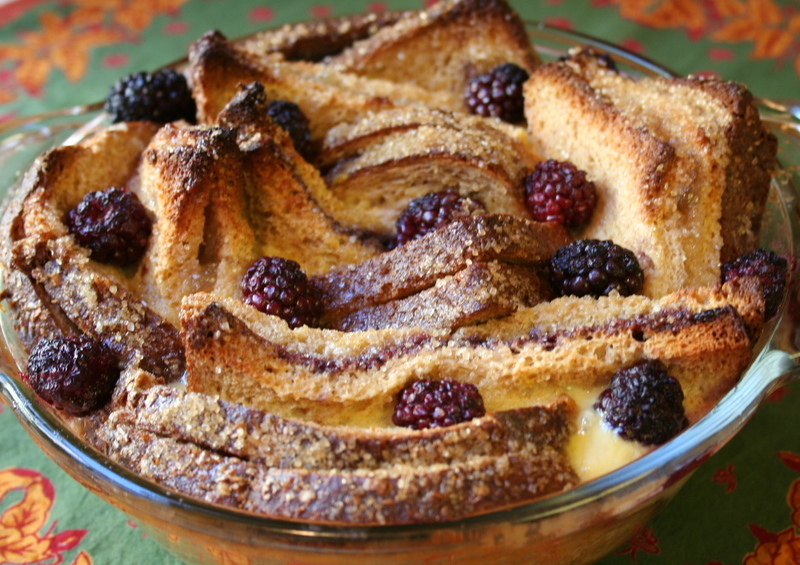 The bread bakes in its dish with the crusts poking up out of the custard, turning golden, crisp and buttery, a delicious contrast to the soft underbelly of the pudding. My record of making this conserve is hit or miss because I was arguing on the phone with a person who will be unnamed to protect the innocent------me. So, taking pictures was a hit or miss proposition. I was so preoccupied I forgot to add the raisins. But, I did remember to include the cranberries, so it turned out pretty good, when you consider that I was stirring and testing for the jellying point as I engaged in heated debate (with said unnamed person). 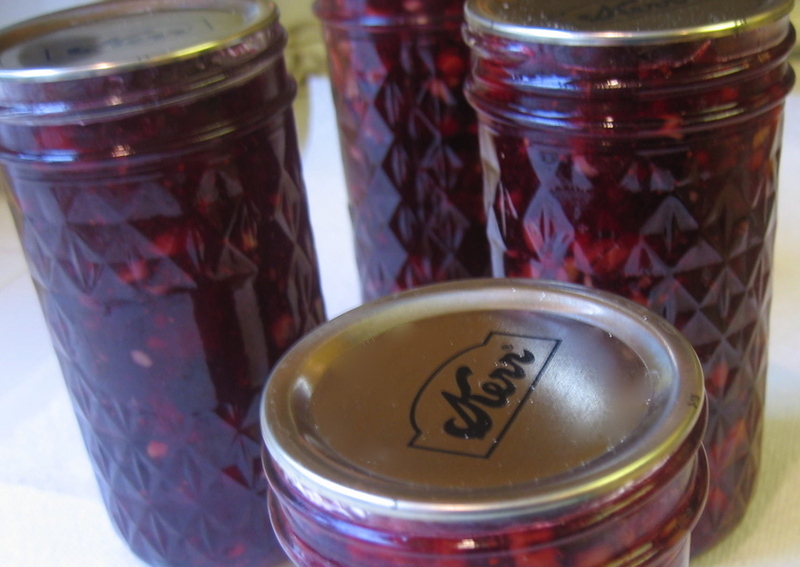 This is a conserve, which is pretty much a jam, with nuts and dried fruit added to it. Since this contains cranberries and an orange, both high in pectin, it should gel fairly easily. But, you never can tell with these things. In the event of gelling failure, you wind up with a lovely thick sauce for ice cream. Anna at Morsels & Musings has come up with a great holiday event, Festive Food Fair. Bloggers from around the world are invited to share special foods they serve during their holidays. So, why am I showing a picture of bread and cranberry conserve? As Christmas approaches it's a tradition for me to bake bread and make jam to give people. I do make the more typical holiday fare such as cookies and cakes, but I find that people enjoy getting a simple loaf of bread as well, to make toast and sandwiches. Several weeks ago I made tomato bread using this recipe, but substituted the pumpkin with tomato puree. It was very good, but the version that I traditionally make during the Christmas season is this recipe. It has a lovely golden color and a light texture that makes very good toast. It's faintly sweet, and goes well with spreads like cream cheese, peanut butter--and jam. It also can be made into good dinner rolls that look quite nice. Several months have passed since I cooked anything from my beloved Mustards Grill Cookbook. Since my taste buds have returned from parts unknown, I decided to celebrate by making a very special sandwich. It's so special Cindy Pawlcyn, the owner of Mustards Grill, says her husband married her because of it. He kept coming back to the restaurant to order it--and wound up falling under her spell too. That's so cute, like a scene in a movie with Tom Hanks and Meg Ryan. Clearly, I had to make the sandwich. Like all the Mustards Grill recipes, it's a layering of different flavors: spicy, sweet, and savory. 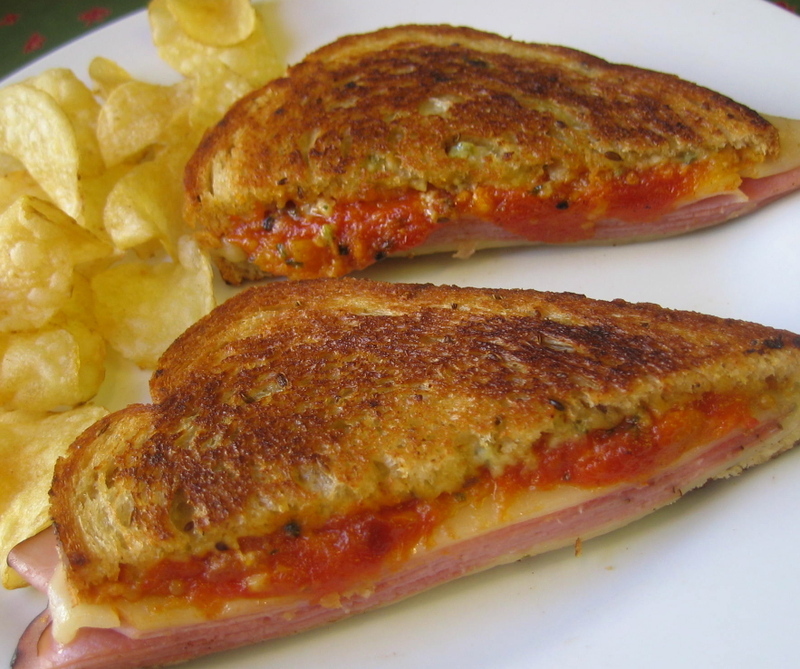 The sandwich has pesto mayonnaise, Jarlsburg cheese, smoked ham and a wonderful tomato apricot chutney full of herbs and spices. 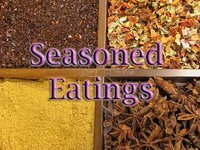 One of the spices is cumin which comes from the same family as King Cilantro, herb of the month and winner of the recent WHB Favorite Herb Contest. But, my spotlight this weekend is on ginger root, one of my favorite cooking ingredients. This weekend our fearless leader, Kalyn, is taking a breather and allowing me to try my hand at hosting Weekend Herb Blogging. If you would like to take part in this event, just send me your link by 3:00 P.M. (Utah time) this Sunday, and I'll include you in the Roundup on Monday. My email address is Rdfern(AT)sbcglobal(DOT)net. Or send me your link in my comments, if you prefer. Here are the rules for Weekend Herb Blogging. I'm still harvesting tomatoes from my garden and my urge to gorge on as many as possible has abated somewhat. I've even stopped dreaming about tomato sandwiches every day. That means I'm now thinking more about making sauce and other tomato based recipes for the end of Summer. On Friday, I made tomato chutney. 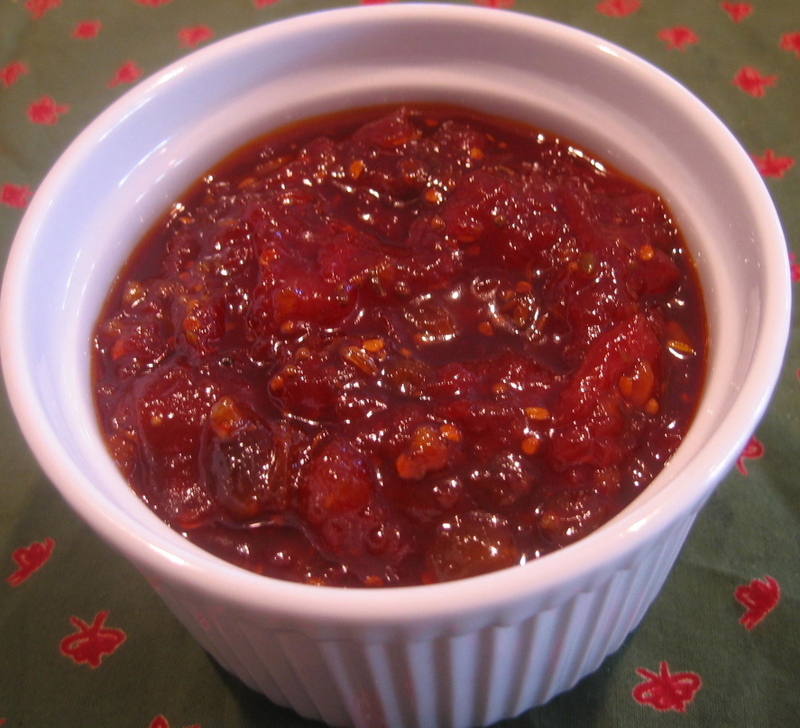 This is a tangy/sweet concoction that tastes great on toast or grilled meats. Like caramelized onions it also lends a unique taste and texture when added to stews. Tonight I added it to a chickpea pilaf. Sounds strange, but it was very nice. And a tablespoon of it thinned with olive oil makes a delicious vinaigrette. I haven't eaten parsnips very often in my life. Based on their rare appearance in the produce section, I'll wager most people haven't either. At one time, they were highly esteemed, much more popular than carrots or potatoes. But eventually potatoes and carrots supplanted them. 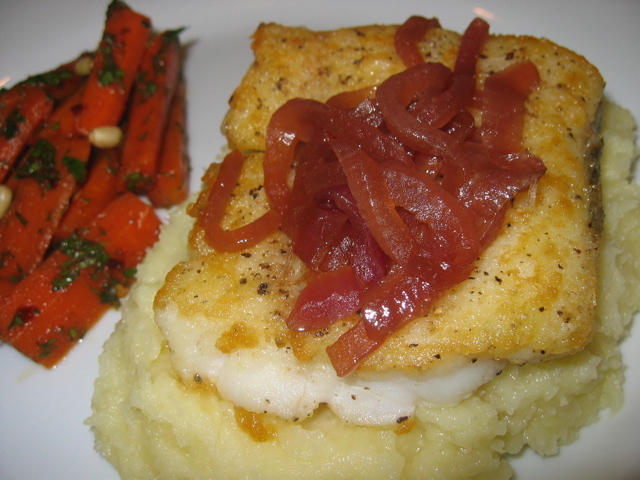 When I saw parsnips at the grocery store, I remembered an interesting recipe in Food & Wine pairing parsnip puree with red snapper and balsamic red onions. It turned out to be a wonderful dish. The parsnips were slightly sweet, with a slight tang that reminded me of horseradish. They tasted very good with the mild snapper and sweet balsamic red onions. An easy recipe, I prepared the parsnips and balsamic onions early in the morning and stored them in the refrigerator until I was ready to cook the fish for dinner. I've heard people complain that parsnips have a harsh flavor and woody core. I didn't find that to be the case at all. The parsnips I bought weren't tough and the flavor was mild. I look forward to eating them again. Red alert!! That's exactly what I hear every time I spoon apricot jam onto bread--because it's my last jar! Two years ago I made a huge supply of apricot, blueberry, and peach melba jam. Now, only one lonely jar of apricot jam is left, and it's almost empty. Obviously, jam making is in order. Here it is, the last jar, and it's still delicious. 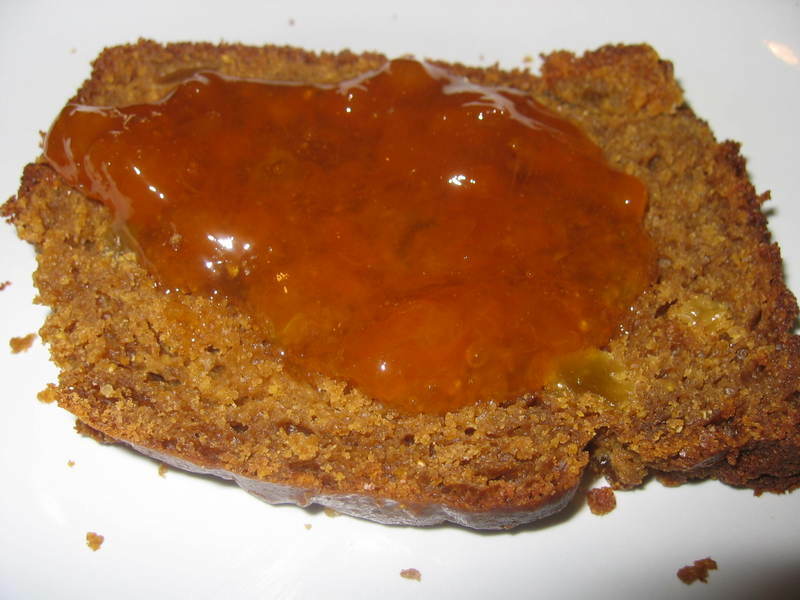 This weekend, I made a loaf of molasses-buttermilk bread which served as a nice backdrop for the jam. The bread has a texture and taste somewhat like brown bread, but you bake it in the oven, rather than steam it. It's faintly sweet and didn't compete with the jam. It would have been rude to make anything that overshadowed this wonderful jam.